Please join us for our Gigantic Annual Yard Sale and Bake Sale, Saturday May 19 from 7 AM until 1 PM in the old Food Lion Building and the former Habitat ReStore Store on Shelton Avenue in Statesville. Rain or Shine! Call or email Donnie Haynes (donaldchaynes@gmail.com 704-929-8526) or Pat Wagner (pwagner1972@gmail.com 704-873-7329) if you have items to donate. See you there! For the most current information on programs, club activities, blood drives, and offsite meetings, please check us out on Facebook. Our meeting on April 11 was held at the Career Academy & Technical School, 350 Murdock Road, Troutman NC. Our speaker was Mr. Dave Sanderson of "The Miracle on the Hudson." Dinner was served by the students in the culinary arts program at CATS. Delicious! We were joined by members of RC Statesville and Greater Statesville and students and staff of Power Cross. Attendance was 95 plus. It was a great presentation by Dave Sanderson,, very uplifting. Thanks to all who attended. We will meet at the Civic Center at our regular time on Wednesday April 19. Please note: Our club will meet at Power Cross on West Front Street on December 14, 2016 at 6:30 PM. We will not meet at our regular time on December 14. Please join us at Power Cross! 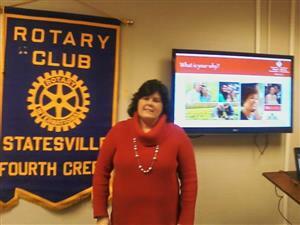 Lynn Grayson from American Heart Association of Charlotte presented a program Building a Culture of Health. There are 7 simple steps to prevent Cardio Vascular Disease. They are monitor blood pressure, be active, regulate hdl, better diet, regulate weight, stop smoking & reduce blood sugar. Check out their web site Life is WhyCB . Bill Kent & Logan Burchette spoke on the new robotics program coming into each of the Iredell Statesville Schools. Cyberkids Robotics is designed to have teams of 8 kids. They build robots with Legos to certain specs set by the program. This is a non-profit organization whose mission is to promote & improve STEM education throughout North & South Carolina. STEM is science, technology, education & math. The teams learn how to solve problems & work together. Teams are very diverse with almost an equal number of females to males. One goal is to break the stereotype that girls don't like engineering. Elementary & middle schools work with robots while high schools work with drones. The goal is that the high schoolers learn rules & regulations in flying the drones that will allow them a federal license to fly one. Competitions are held annually for each school system Iredell will host one April 16 at Statesville High School. There will be 33 teams competing this year. You can find more information on www.cyberkidrobotics.com. Fourth Creek Rotary presented a check to Children's Hope Alliance in the amount of $5,500.00. The proceeds were from the Laura Laws Memorial Golf Tournament. In addition to the donation, the second place team contributed their win to the home also. Pictured are Kenneth Davis, Kristen Dopf from Children's Hope Alliance & President Elect Leon Ijames. Nina Waters, manager for Donor Systems for the Boys & Girls Club of the Piedmont, accepted a check to the Boys & Girls Club in the amount of $3,250.00. Proceeds were from the Laura Laws Memorial Golf Tournament. The Boys & Girls Club has received almost $30,000.00 since the beginning of the tournament. Next to Nina is Chris Bates & Skip McMurry. Fourth Creek Rotary presented Natalie Stormant of Power Cross a check for $5,000. The funds were part of the money raised from the Laura Laws Memorial Golf Tournament. Natalie & husband Jeff, have worked selflessly reaching out to boys in need of guidance. Last school year had the first group of graduating boys. They had a 100% graduation rate. Bradley Messick followed up with Fourth Creek Rotary letting them know how the $1000 donated to them was spent. The had a youth trip to Weaverville in Windy Gap, NC. They were able to offer scholarships to many students in order for them to attend the trip. Bradley reaches out to high school students building relationships that hopefully lead them to Christ. Chris Bates & Skip McMurry presented Maggie Hamm, marketing VP from Carolina Farm Credit, accepted an award from Statesville Fourth Creek Rotary recognizing their support for the SEEDS Program. 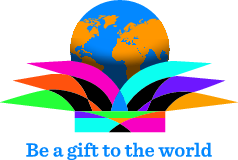 They have provided $10,000 over the last 10 years helping make an impact growing food world wide. She stated that they partnered with Fourth Creek because they feel strongly in supporting farmers across the US & feel this is an opportunity to impact farmers across the world. 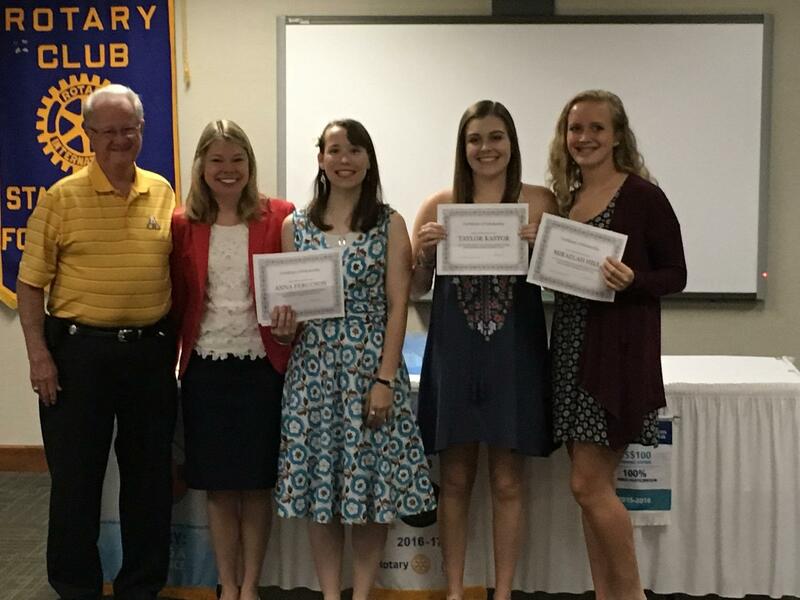 The Fourth Creek Rotary also matched $2,500 raised by the local Interact Clubs to increase the impact the seeds have globally. Statesville Fourth Creek Rotary hosted the Laura Laws Memorial Golf Tournament Sept. 17, 2015. Money raised supports scholarships for Iredell Co. & Alexander Central High School Seniors. Laura had a passion for children & their learning. There were three former NBA celebrities on hand golfing, signing autographs & sharing their stories why they "serve". Phil Ford, Al Wood, and Tommy Burleson were the main attraction after the dinner. All three shared their stories about how someone opened the door for them to allow them an opportunity and they felt led to "pay it forward". Burleson said being able to serve others is the greatest gift ever.